Grit and resilience aren’t natural skills you’re born with. They’re something that you have to build. It’s something you can learn. 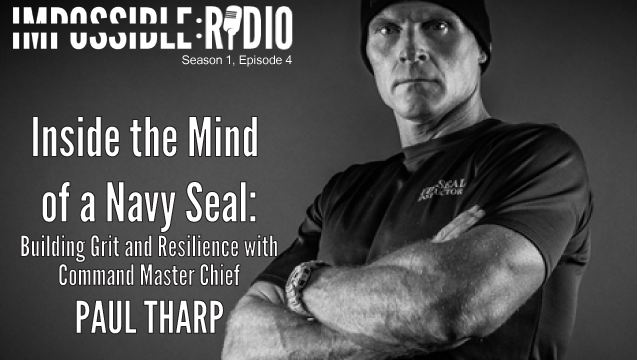 Over his incredibly successful career, Command Master Chief Paul Tharp has built such an incredibly resilient mind that he now teaches aspiring seals how to do it too. Listen to this week’s episode of Impossible Radio and become more resilient, today. This counts as one of the best podcast episodes I’ve ever listened to. CMC (Ret) Tharp is a warrior and trainer of warriors…the real deal. His insights on the SEAL training pipeline, mindset, and team dynamics are fantastic. I learned so much from this conversation. I plan on listening to this episode many times again in the future. – How you connected CMC Tharp’s message to your own writings on grit, resilience and asking what you’re willing to give up to reach your goals. Your podcasts just keep getting better and better. I’m looking forward to the rest in this series!